Destiny 2 has two level types: character level and Power level, maxing out at 20 and 300 respectively. Reaching the max character level is very straightforward: just play through the game normally and you’re likely to be level 20 shortly after the campaign ends. As for Power level, the only way to increase it is through your gear. Armor and weapons will determine your Power, and that level will be limited once you reach 260. After 260, you’ll only get ‘sidegrades’ from the normal loot sources. However, you will be able to progress past 260 with the help of specific Milestones. Milestones require you to complete specific challenges, and their rewards will vary. 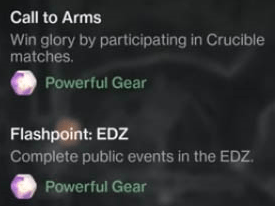 The Weekly Milestones that offer “Powerful Gear” as a reward is what you’re looking for – this will provide a guaranteed upgrade to what you currently have. If you’re Power level 260, and complete a “Powerful Gear” Milestone, you’ll earn a piece of loot that exceeds 260. This is especially important in the beginning, since the Raid & Trials will require the best possible gear. To reach Power level 260, simply complete activities as normal. Every other Milestone (besides the “Powerful Gear” variety) should be completed. Continue to equip the gear you acquire with a higher Light Power level. Even if you’re not trying to rush through the content, it’s still a smart idea to hold off on completing the Weekly Milestones until you’re 260. There’s only a few that are available each week (Flashpoint, Nightfall, & Call to Arms) so it just doesn’t make sense to get a guaranteed upgrade when you’re below 260, because upgrades will come naturally and quickly, just by playing.